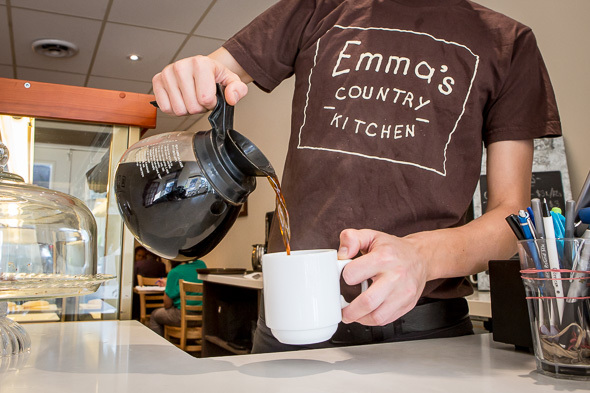 Emma's Country Kitchen is known for their breakfast, as well as their homemade frozen comfort foods and delicious baked goods like donuts that have made TV appearances. In this location, they're able to serve more customers than at the original which had a successful run for a few years just down the street. Here, they have optimized the flow of the restaurant with their signature frozen goods, baked items, beverages and to-go lunches at the front. 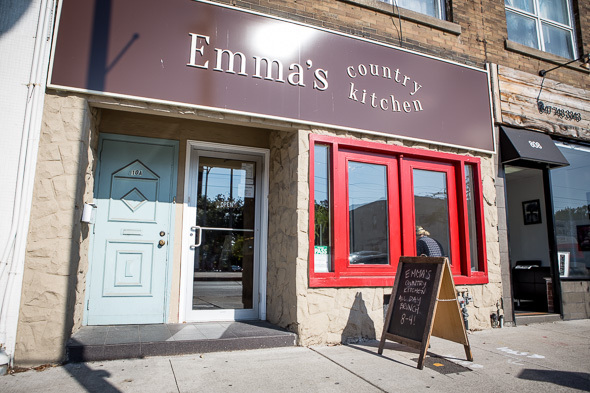 Head chef is Rachel Pellett and Emma was her grandmother. Touches of hers are still in every recipe, like the famous biscuits here and the "Lazy Daisy" cake that adorns the counter. 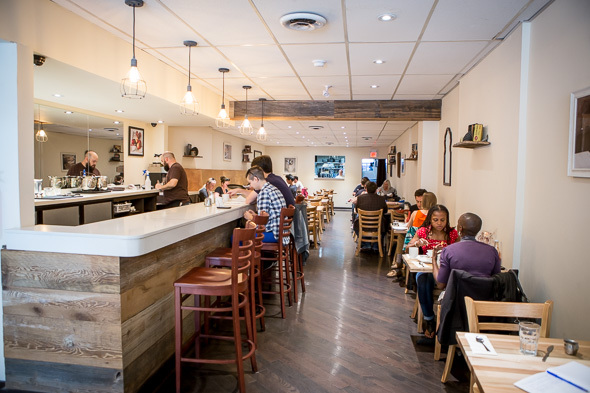 They also serve alcoholic beverages for a true brunch along with their fair trade regular or decaf Reunion Island coffee and Tea Squared tea. 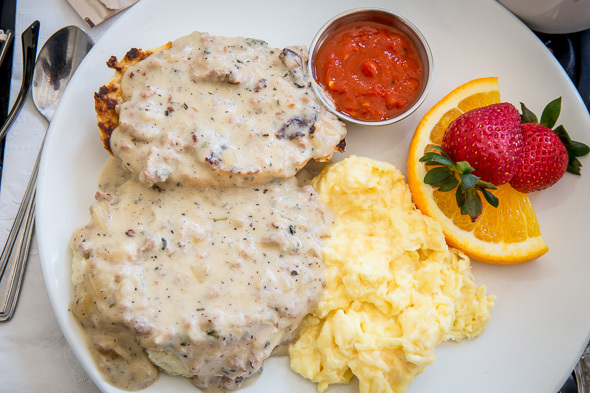 The biscuits and gravy ($11) are to die for, Emma's biscuits ladled with a generous portion of homemade sausage gravy made with buttermilk and hot sauce, served with a side of soft scrambled eggs (cooked less so they're a little more moist) and a side of the hot sauce. 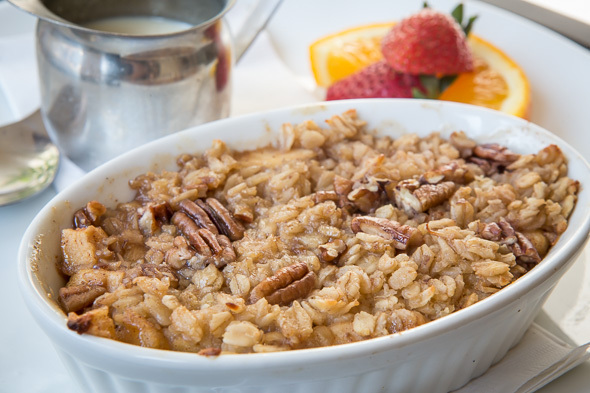 We also try the apple, cinnamon and pecan baked oatmeal ($9). It's perfectly comforting, a layer of cinnamon sauteed apples topped with layers of creamy oatmeal and a brown sugar pecan crumble, which you're then invited to drizzle with cinnamon custard. The fruit in this rotates seasonally, and both breakfasts came with an orange slice and strawberries. Frozen items are always selling, but they try to keep the well-stocked freezer full. 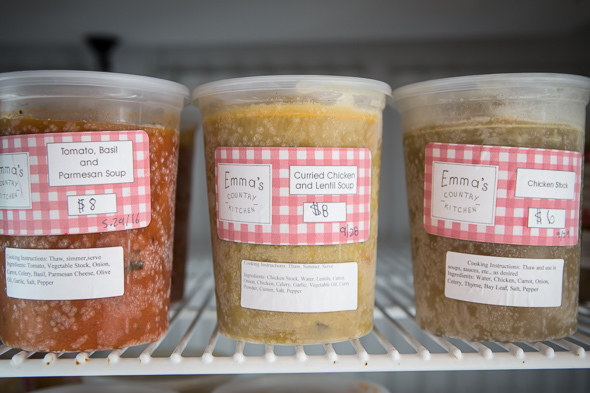 Their chicken mushroom leek soup is apparently a huge seller, and all their homemade soups and stocks are reasonably priced under $10 for a good amount. 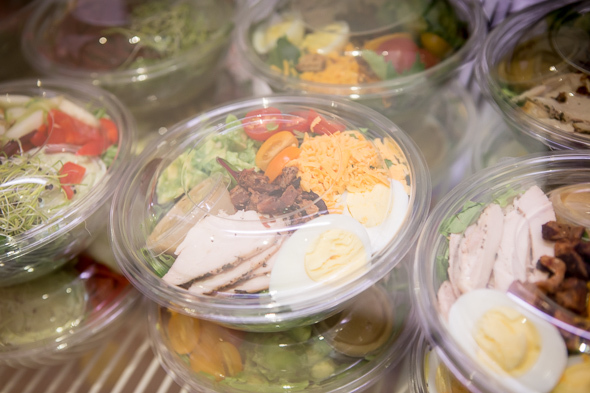 Hearty salads are reasonably priced, too, available in a lunch counter that also holds juices and other jarred home confections like bacon jam ($8) and vinaigrettes both balsamic and honey dijon ($5). This classic cobb ($10) is mixed greens, roasted chicken breast, cherry tomatoes, avocado, aged cheddar, house cured bacon lardons and hard-boiled egg with honey mustard. 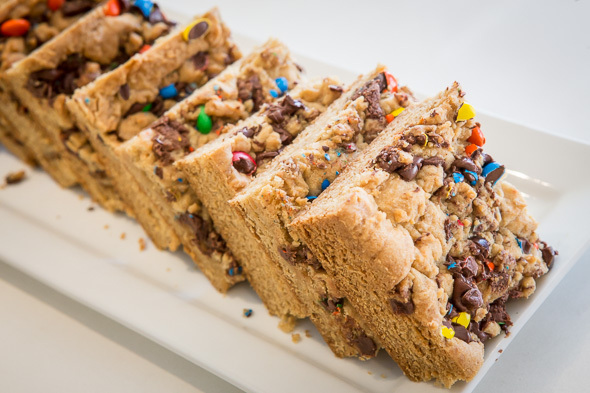 If you buy a half-dozen baked goods there's no tax, but similar to the frozen items call ahead to make sure you get your favourite, like one of the M & M blondies ($3).